While technology has an increasing impact on our daily lives from social relationships to politics, female computer scientists actively influencing these developments are still in short supply. Barely 13 percent of bachelor degrees in computer sciences were earned by women in the US last year. 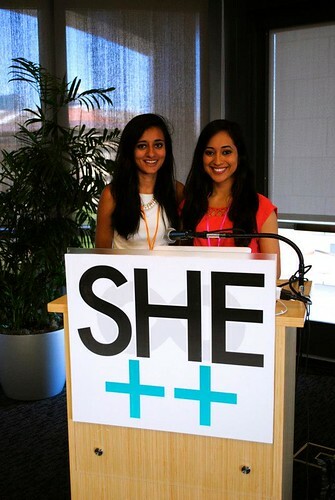 Stanford students Ayna Agarwal and Ellora Israni founded She++, an annual conference and initiative to inspire more women to pursue and explore computer sciences. Ayna Agarwal and Ellora Israni entered Stanford as majors of psychology and human biology in 2010. Inspired by role models such as Marissa Mayer and Jocelyn Goldfein and hooked after attending Stanford's popular introductory CS course, they switched their majors to pursue computer sciences and founded She++, Stanford's first conference on women in technology. Within one year, She++ evolved into a nation-wide community for female computer scientists and engineers. In April, they hosted their second annual conference at Stanford and launched a new mentorship-programme to connect high school girls with computer scientist majors. We spoke with Ayna and Ellora about the challenges and rewards of programming, their experiences along the way and their latest project: a documentary featuring female engineers, founders, students and scholars. Do you think everyone should learn how to program today? E: Yes absolutely. If you want to be a designer, a teacher or a farmer, you need to know how to program. It's as integral as reading and writing and basic arithmetic, because we all live on the Internet. It's part of being educated about the world around you. I'm not saying everyone needs to be a professional programmer – we're not all professional readers, writers and mathematicians either – but we need coding as a skill to navigate everything around us. The same way you have a basic idea of how your toaster functions so you can use it properly and fix it if it's broken, you should have an understanding of the phones and computers you use on a daily basis. It's an incredibly empowering skill. Why is it particularly important to bring more women into tech and encourage them to aspire a career in this field? E: Two reasons. First, it's a numbers game. By 2020, the United States will only have a third of the computer scientists it needs. These people are solving the most interesting, significant problems we have today, and they will be in dangerously short supply. Women – and minorities in general – are the greatest untapped brain trust of engineering potential. I'd hate to think that women are being excluded from such a rewarding career, and from an industry who will really benefit from having them, because of something as superficial as a stereotype. Second, it's a feminist issue. Women are making the decision to exclude themselves from engineering not because they actually don't enjoy the field, but because they feel artificially incapable. That's something that should scare anyone who believes women can do anything men can do. Right now, we can't. And it's because of stereotype threat and impostor syndrome. We need to get to the point where gender is a non-issue in engineering, and it starts with addressing the social – not the technical – issues. Based on your experience, do you think women still have to be more determined and work harder to be taken seriously in this field? E: No, absolutely not. I think one of the best things about Silicon Valley is that it truly is a meritocracy. As a computer scientist, I don't think I have ever been judged on anything besides the value of my intellect. Sure, people will ask how someone like me ended up in computer science, or they'll raise their eyebrows at my assertion that I've never been inclined to read Reddit. But when it comes down to it, the people I work with have judged my intellectual merit. I will say though that it's intimidating to walk into a room and be the only woman. But I don't think that means I've had to work harder, just that I've had to develop as a person. It has given me a 'tougher skin', but I believe that tougher skin has actually benefited me immensely inside and outside of work, and thus I'm grateful for it. I do hope that someday women won't need a tougher skin to be technical professionals, because for some women that's actually the most intimidating part of it, but for now I'm grateful for having it. Numbers show that fewer women in the Western world take up CS classes and often the drop out rate is also higher compared to the one of their male fellows. What do you think are factors that cause this gender gap? A: Firstly, there is a massive difference in the educational systems between the Eastern and the Western world. To generalize, the Western world offers more flexibility in changing a student's course and often times, in the Eastern world students have to choose their academic course, thereby their professional career, before college. This requires students at a young age to explore and define different subjects. When we look at girls entering college who have never programmed before, you'll see the inherent disbelief and lack of confidence ensue. First time coders are competing with people who have been programming for several years, and thus face social stigmas and barriers to a higher degree. When students are encouraged to explore career paths at an early age, they are often more open to the idea of different subject domains and more receptive to critical feedback. Programming requires resilience – you'll get bugs after bugs after bugs. And teaching these programming skills to more open-minded youth make it a less intimidating environment. Unfortunately, many Western schools do not even offer CS classes in the pre-college stage, and therefore bright-eyed youth can lose an opportunity to feel safer and more confident in their learning a completely foreign subject. You also link to some MOOCS on the She++ website where you can learn how to code and recently starred in one of Udacity's 'Introduction to Programming' online courses. Do you think MOOCS can also help to lower the barriers? A: MOOCs are wonderful in providing access to anyone interested in engineering, or any subject matter, for that fact. But, we are just at the beginning of the revolution right now. MOOCs have not solved the problems of societal standards, and academic support structures, or personal motivation. MOOCs are designed for people who are aware of the benefits of coding – it does not provide a forum to inspire or support the skeptics. Similarly, programming often requires a lot of initial start-up support in terms of basic bugs and frameworks. We see MOOCs heading in the right direction, but there is still much to consider when attempting to lower barriers. Your conference featured speakers such as Jocelyn Goldfein, Director of Engineering at Facebook, Tracey Chou, Software Engineer at Pinterest and Maria Klawe, President of Harvey Mudd College who has succeeded in attracting more women to the field raising the percentage of female computer science majors to 40% at Mudd. Can you share some insights of what you have learned during the course of She++? A: I've spent a lot of time getting to know the women listed above, and many more who are making incredible personal and global strides with tech. The Valley that most people are familiar with prizes innovation for often the top-most socioeconomic bracket. However, these women showed me that there is more to our esteemed Valley than the latest hi-tech gadgets or the newest touch screen user experience. The biggest lesson I have learned is that you can have an impact with the use of technology even if it is a path not often traveled: Some of the most fulfilled leaders in technology are placing company culture, developing economies, or their triple bottom line on their primary agenda... and still succeeding. There is a community out there willing and ready to bring technology to help provide the basic needs for humans worldwide. Your short-film documentary sums up facts and numbers around the topic and features interviews with female entrepreneurs, engineers, professors and students sharing their personal stories. How did you come up with the idea and how is the response you have received so far? We produced the documentary, because we saw the need for a more polished vehicle for our message, and for one that could be disseminated beyond the Bay Area. The documentary trailer has hit over 25,000 views on Youtube and the film has already reached 12 countries in over 100 viewings and discussions. We've received some incredible feedback and learnings which we'll share with you at the conference! We'll be showing snippets at the conference, and are proud to announce it's public release on July 22nd, right after DLDWomen! Ayna Agarwal and Ellora Israni will speak at the upcoming DLDwomen conference, taking place in Munich July 15 - 16, 2013. Apply for a ticket to this exclusive conference, tune in on the beat of our community on the DLDpulse and find regular updates on the DLDw13 programme and speakers here.